Join the discussion on our forums! Come discuss Unsleeping Soul over in our dedicated Unsleeping Soul discussion topic. It's 3 am. Do you know where your soul is? No, if you cast this on Leeroy Jenkins, you get a 6/2 without Charge because it's silenced. just play faceless for one more mana..
And what are you going to do with the new copy before it dies? 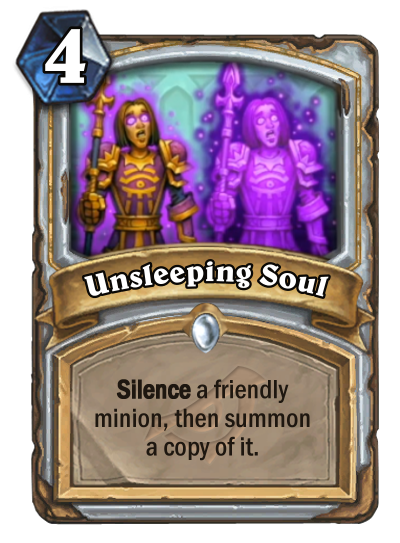 I do like that this wasn't specifically designed for OTK decks. or better in the right deck. Or Arcane Watcher for example.